Bullying and cyberbullying are recognized globally as complex and serious problems that have significant negative health and social impacts. Prevention and intervention approaches that seek to address these problems can have an impact on the short- and long-term effects of bullying/cyberbullying others and/or experiencing victimization. Research has demonstrated that at least one in three Canadian youth report having been bullied in the recent past, and 10% of individuals report being bullied on a daily basis. Further, 47% of Canadian parents report having a child who has been bullied (Molcho et al., 2009; Vaillancourt et al., 2010). In particular, during the school years bullying is one of the most common expressions of violence in the peer context (Menesini & Salmivalli, 2017). Although there is no single standardized definition of bullying, it is generally characterized by an intentional, repetitive pattern of aggressive behaviour accompanied by an imbalance of power between perpetrators and victims, which separates bullying from other types of interpersonal conflict situations (Thomas, Connor, & Scott, 2014). This aggression can take direct and indirect forms, either alone or in any combination: (1) physical (i.e., hitting, kicking, spitting, pushing, and stealing or breaking personal belongings, etc. ); (2) verbal (i.e., taunting, malicious teasing, name calling, and making threats); and (3) psychological (i.e., spreading rumors, manipulating social relationships, or engaging in social exclusion, extortion, or intimidation tactics) (Ericson, 2001). Bullying is often directed toward one or more specific characteristics of the targeted individual, such as social class, race, religion, gender, sexual orientation, appearance, behaviour, personality, reputation, strength, size, and/or ability. Further, the impacts of bullying extend far beyond the particular incidents where it occurs. Research has shown that both the perpetrators and targets of bullying may experience serious, long-lasting negative life consequences. Perpetrators of bullying have been shown to be more prone to similar antisocial behaviours in both adolescence and adulthood. In particular, they may turn into adolescents who sexually harass, become involved in delinquent or gang-related behaviours, or engage in dating violence. Further, as adults, they may engage in harassment in the workplace, spousal, child or senior abuse, and other forms of criminal offending (Ttofi, Farrington, Lösel, & Loeber, 2011). On the other hand, victimization is followed by an increased risk of depression, symptoms of suicidal ideation, and low-self-esteem (Kaltiala-Heino et al., 1999; Klomek et al., 2015). Such issues have been shown to persist over time. For example, “individuals formerly bullied were found to have higher levels of depression and poorer self-esteem at the age of 23, despite the fact that, as adults, they were no more harassed or socially isolated than comparison adults” (Olweus, 1994, as cited in Fox et al., 2003, p. 8). Moreover, bullying can occur within any context where humans interact, such as school, home, the workplace, and neighbourhoods. As discussed in more detail below, bullying is becoming increasingly prevalent in virtual environments. A recent Canadian survey found that 23% of Canadian students from grades 4-11 have said or done something mean or cruel to someone online, whereas 37% reported that someone has said or done mean or cruel things to them online that made them feel badly (Steeves, 2014). In a 2008 National Issues in Education Poll, Canadian teachers ranked cyberbullying as their issue of highest concern out of six listed options. Cyberbullying is a form of indirect bullying that involves the use of technology. It takes place via any digital device (i.e., computers, tablets, and cell phones), and most commonly occurs within social media environments (e.g., Facebook, Instagram, Snapchat, and Twitter), discussion forums and gaming environments, as well as through text messaging and email (Kiriakidis & Kavoura, 2010; Public Safety Canada, 2015; Smith et al., 2008). As is the case with bullying that occurs in physical environments, cyberbullying occurs repeatedly, is intended to intimidate, humiliate, and embarrass the targeted individual, and has similar long-term consequences for behaviour and mental health. However, cyberbullying does have some distinctive features that set it apart from other forms of bullying. For one thing, the online environment gives the perpetrator the protection of anonymity, which can also increase the level of aggression beyond what might occur in face-to-face encounters – because cyberbullies cannot see their targets' reactions, they are less likely to experience guilt and remorse for the bullying. Further, rather than being limited to specific physical locations such as the school or the workplace, cyberbullying can occur anywhere at any time; all that is required is access to the internet. Relatedly, whereas bullying in the physical environment typically occurs in front of small numbers of witnesses, cyberbullying can take place in front of practically unlimited numbers of people, that is, it can “go viral”. And in many cases, online information is permanent and public unless it is reported and removed. This can lead to potential long-term negative impacts on a person's reputation – for both perpetrators and targeted individuals alike – and thereby affect future outcomes such as university admission, employment, and personal relationships. Cyberbullying is uniquely associated with mental health issues and academic problems over and above those noted for other forms of bullying (Vaillancourt, Faris, & Mishna, 2017). Of particular note, cyberbullying is strongly and independently associated with suicide (Kowalski, Giumetti, Schroder, & Lattanner, 2014), which is the second leading cause of death among Canadian youth (Navaneelan, 2009). In general, both bullying and cyberbullying cut across many demographic, geographic and socioeconomic contexts. However, research shows that certain groups are disproportionately vulnerable to these issues. Overall, adolescents are argued to be much more highly involved than adults, given their reduced level of maturity with respect to capacities such as thrill-seeking, impulse control, peer pressure, reward sensitivity, cognitive processing, and rational decision-making and long-term planning (Cohen-Almagor, 2018). In addition, several studies suggest that the prevalence and forms of bullying are different across age groups. Bullying tends to peak during the middle school years (i.e., 12-15 years), and tends to decrease by the end of high school (Hymel & Swearer, 2015). With respect to the forms of bullying, increasing age appears to be associated with a shift from physical bullying to indirect and psychological bullying (Rivers & Smith, 1994). With regard to gender differences, it is commonly reported that boys are more likely to be involved in bullying others than are girls (Pepler, Jiang, Craig, & Connolly, 2008), although some studies have found little difference. Most studies have found that boys are more likely to be involved in physical forms of victimization, whereas bullying among girls is more likely to be either verbal or psychological in nature, such as social isolation, slandering and the spreading of rumors (Besag, 2006; Van der Wal, de Wit, & Hirasing, 2003). Furthermore, some surveys have found that minority groups – namely ethnic minorities and especially gender minorities – report higher levels of involvement in bullying and cyberbullying both as perpetrators and victims, as compared to majority groups (e.g., Llorent, Ortega-Ruiz, & Zych, 2016; see also Espinoza & Wright, 2018). In Canada, the results of the 2014 General Social Survey (victimization component) showed that homosexual/bi-sexual individuals were more than twice as likely as heterosexual persons to report being cyberbullied (Hango, 2016). Studies have also shown that young people with disabilities are at a greater risk of being victimized than their peers (Menesini & Salmivalli, 2017). Knowledge of risk and protective factors – for both victims and perpetrators – provides insight into the larger picture of bullying and cyberbullying, and can offer guidance for developing more focused efforts by helping to identify relevant areas for prevention and intervention. Individual Level – At the individual level, gender, age, personality traits (e.g., intelligence, empathy, hyperactivity and self-esteem) appear to be risk factors associated with an increased prevalence of bullying and cyberbullying (both perpetration and victimization). For example, empirical studies have suggested that males are more likely to engage in bullying and cyberbullying, whereas females are more likely to be victims of cyberbullying attacks. Similarly, both bullying and cyberbullying perpetration and victimization peak in middle school, with those having lower levels of empathy (i.e., ability to understand the emotions of others) being more likely to bully and cyberbully others. Family Level – At the family level, parental treatment and family behaviour appear to be risk factors associated with prevalence of bullying and cyberbullying perpetration. For example, children who have experienced parental maltreatment, particularly physical or sexual abuse, and/or who have a weaker emotional bond with their parents are more likely to be perpetrators of bullying and cyberbullying. Peer/School Level – At the peer and/or school level, perpetrators of cyberbullying appear to be linked with greater numbers of violent peers, whereas victims of cyberbullying report a greater number of problems with their peers. Studies have also shown a connection between cyberbullying perpetration and victimization to negative school climate. Individual Level – At the individual level, studies have found lower levels of bullying perpetration and victimization for those with particular personality traits, including high problem-solving and coping skills. Family Level – At the family level, researchers have suggested that lower levels of bullying perpetration and victimization are linked to treatment by parents. Specifically, those with lower propensity to be perpetrators or victims of bullying were more likely to have supportive and authoritative parents. Peer/School Level – At the school level, lower levels of bullying and cyberbullying perpetration have been linked to school connectedness (i.e., the degree to which students believe that adults and peers in the school care about their learning, as well as about them as individuals) and positive school climate. Indeed, studies have found that those who feel more connected to their school and who perceive the climate to be trusting, fair and pleasant were less likely to be perpetrators in bullying and cyberbullying incidents. The prevention of bullying and cyberbullying behaviour in children and young people is an important factor for reducing the likelihood of future criminal activity. Below are examples of established programs that have been implemented to address bullying and cyberbullying. Note that the list is not to be considered exclusive or exhaustive, but rather is just intended to identify some approaches to address these issues of interest. The growing awareness of the problem of bullying has led to the development of numerous anti-bullying interventions, which aim to reduce both bullying and victimization. Some interventions focus on increasing positive involvement in the bullying situation from bystanders or witnesses. The Fourth ‘R' curriculum encourages a comprehensive school-wide approach to preventing violence/bullying and promoting healthy relationships. It includes lesson plans, role playing activities, video and online components, all taught through a teacher. The Fourth ‘R' grew out of the Youth Relationships Project (YRP), a dating violence prevention program that was developed for youth with family backgrounds of maltreatment and violence. The Fourth ‘R' approach takes into consideration the presence of new difficulties in the lives of young people. The program emphasizes the importance of the right ‘type' of intervention during adolescence, as it is during this period of time that problems with bullying/violence, substance use, and high risk sexual behaviours first appear. Consequently, effective intervention at this stage of life must consider the unique context and challenges that are present in adolescence. Therefore, the harm-reduction/health promotion model used by the Fourth ‘R' curriculum is more successful for young people than the traditional forms of intervention that require the complete absence of high-risk behaviour. KiVa is an evidence-based program developed at the University of Turku in Finland. It includes both universal actions to prevent the occurrence of bullying and indicated actions to intervene in individual bullying cases. The universal actions, such as the KiVa curriculum (student lessons and online games), are directed at all students and focus mainly on preventing bullying. The indicated actions are to be used when a bullying case has emerged. They are targeted specifically to the children and adolescents who have been involved in bullying as perpetrators or victims, as well as to several classmates who are challenged to support the victim; the aim is to put an end to bullying. The program has three different developmentally appropriate versions for Grades 1-3 (Unit 1), 4-6 (Unit 2), and 7-9 (Unit 3). The Olweus Bullying Prevention Program is a multi-level, multi-component program designed to reduce and prevent school bullying in elementary and middle schools. Secondary goals include increased awareness and knowledge about bullying, involvement of teachers and parents in bullying prevention, development of clear rules against bullying and providing support and protection to victims. The program includes school level, classroom level, and individual level components. The school level components consist of an assessment of the nature and prevalence of bullying in the school, the formation of a committee to coordinate the prevention program, and development of a system ensuring adult supervision of students outside of the classroom. Classroom components include defining and enforcing rules against bullying, discussions and activities to reinforce anti-bullying values and norms and active parental involvement in the program. Individual components intervene with students with a history of bullying and/or victimization. The Canadian Red Cross offers the Beyond the Hurt (BTH) program which trains middle and high school students to deliver workshops to their peers on issues related to bullying. The in-depth student training typically takes place over two days, and focuses on (a) increasing knowledge and awareness of bullying, (b) teaching bullying intervention skills, (c) encouraging student-led advocacy, and (d) emphasizing the importance of intolerance of bullying (e.g., reporting/responding to bullying). Students are trained as “Youth Facilitators” and are equipped with leadership and presentation-related skills in order to deliver workshops to their peers about what they have learned. A goal of the program is that the peer-led workshops will contribute to the prevention of bullying in the school Program materials are available in English and French. This program is applied over several years as students transition through elementary school to high school, addressing different themes that could arise within personal relationships between young people. Socio-emotional competence, critical thinking, social responsibility and the prevention of relationship violence are the goals of the program. The R+R curriculum is delivered to students through a series of 12 workshops per year, in grades 7, 8, 9 and 10. The curriculum focuses on respect, empathy, bullying, and how to apply prosocial skills learned in programming. While bullying and victimization are aspects of the program, it is focused on developing interpersonal respect and skills for healthy relationships among adolescents. Workshops for grade 11 and 12 cover the very topical and important subject of internet safety. The WITS Primary Program is a community-based, school wide intervention that brings together schools, families, children, and communities to prevent bullying and peer victimization. The program is centered on conflict resolution, leadership and youth development, parent training, school-based strategies, skills training, and social emotional learning. Almost all of the WITS Programs resources are available free-of-charge on the WITS website, including the resource guide, lesson plans, videos, posters, and pamphlets. Only the WITS books and reminder gifts cannot be provided online; however, they can be obtained cost-effectively. There are very few interventions specifically targeting cyberbullying behaviours, and even fewer rigorous evaluations of these interventions (Cioppa, O'Neil, & Craig, 2015; Nocentini, Zambuto, & Menesini, 2015). Young people often refuse to seek help from an adult for fear that their access to communication technology will be taken away (Tokunaga, 2010). Research results suggest that more work needs to be done to facilitate safer and more convenient reporting, as well as ensuring that appropriate actions are taken after a report is received. Engaging both adults and young people in this process is essential. Innovative, youth friendly solutions are needed. For example, infographics, online games, applications, or software may be an effective way of educating young people about cyberbullying and changing patterns of interaction. However, none of these innovative initiatives have been rigorously tested for effectiveness to date. This approach uses virtual experience scenarios in an attempt to increase positive bystander behaviours (i.e., defending), as well as reduce negative bystander behaviours (i.e., passivity, joining). A recent study suggests that the approach can improve self-efficacy, prosocial skills, and the intention to act as a positive bystander (DeSmet et al., 2018). This is a free application that detects harmful language/messages before they are sent out. According to the developer, ReThink will stop a given young person from sending such a message/post 93% of the time. This is an application downloadable onto smartphones. The organization gives students a code to use the application. If they see bullying, substance abuse, violence and aggression, or anything else inappropriate in the school context, they can report it via their phone, and a school administrator can respond/investigate. Efforts can consist of assemblies or workshops for children and young people, parent meetings, in-service training for teachers and practitioners, or community forums to make participants aware of the problem of bullying. Although raising awareness is important, on their own such efforts are insufficient to change cultural norms and bullying behaviours (Limber, 2003; Molnar-Main, 2014). Bullying and cyberbullying programs should attend to the needs of individuals directly involved. Children and young people who bully others (and who are bullied) can benefit from interventions and supports that address their unique social, emotional, and behavioural needs. Recommendations have been made to include strategies such as peer counseling and training in emotional control (Lee, Kim, & Kim, 2015). These strategies seek to address peer processes that can promote prevention, stop bullying/cyberbullying and focus on the development of healthy relationships. Examples include extracurricular student groups focused on supporting inclusion and prosocial norms; the training of student leaders (communication skills, conflict resolution, bystander strategies); and mentoring programs (Limber, 2003; Molnar-Main, 2014). Numerous curricula have been developed for use within elementary, middle, and high schools. In general, these programs try to explain bullying/cyberbullying and its effects, teach strategies to avoid bullying/cyberbullying or for intervening, and build social cohesion among students. Curriculum-based programs should also take a whole school approach. Dealing effectively with bullying requires time, extended training for school staff, enhanced monitoring, more effective strategies for responding to specific bullying incidents, and more successful ways of engaging and securing the cooperation of parents (Cunningham et al., 2017). Many of these programs have been evaluated, and some have been found to be effective in improving desired outcomes. Bullying and cyberbullying are best addressed through comprehensive, multi-tiered frameworks that focus on shifting norms and practices of students, staff, and other adults. Comprehensive approaches target the larger school community in an effort to change school climate and norms. School-wide education, routine interventions, and intensive interventions should also be included. 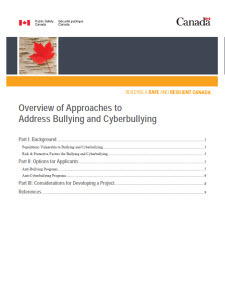 Further, although comprehensive approaches acknowledge the need for a long-term commitment to addressing bullying and cyberbullying specifically, they are often done as part of a larger violence prevention effort. A comprehensive approach should be tailored to the needs of a particular school or community; simply using prefabricated programs rarely works (Seeley et al., 2011). Ang, R. P., & Goh, D. H. (2010). Cyberbullying among adolescents: The role of affective and cognitive empathy, and gender. Child Psychiatry and Human Development, 41, 387-397. Baldry, A. C., & Farrington, D. P. (2005). Protective factors as moderators of risk factors in adolescence bullying. Social Psychology of Education, 8(3), 263-284. Bania, M., Roebuck, B., & Chase, V. (2017). Local adaptations of crime prevention programs: Finding the optimal balance between fidelity and fit. Literature review. Ottawa, ON: Public Safety Canada. Bania, M., Roebuck, B., O'Halloran, B., & Chase, V. (2017). Local adaptations of crime prevention programs: Finding the optimal balance between fidelity and fit. Key effective elements of crime prevention programs. Ottawa, ON: Public Safety Canada. Besag, V. E. (2006). Understanding girls' friendships, fights and feuds: A practical approach to girls' bullying. New York, NY: Open University Press. Bowes, L., Arseneault, L., Maughan, B., Taylor, A., Caspi, A., & Moffitt, T. E. (2009). School, neighborhood, and family factors are associated with children's bullying involvement: A nationally representative longitudinal study. Journal of the American Academy of Child & Adolescent Psychiatry, 48(5), 545-553. Cioppa, V. D., O'Neil, A., & Craig, W. (2015). Learning from traditional bullying interventions : A review of research on cyberbullying and best practice. Aggression and Violent Behavior, 23, 61-68. Cohen-Almagor, R. (2018). Social responsibility on the internet: Addressing the challenge of cyberbullying. Aggression and Violent Behavior, 39, 42-52. Cunningham, C. E., Rimas, H., Mielko, S., Mapp, C., Cunningham, L., Buchanan, D., … Marcus, M. (2017). What limits the effectiveness of antibullying programs? A thematic analysis of the perspective of teachers. Journal of School Violence, 15(4), 460-482. DeSmet, A., Bastiaensens, S., Van Cleemput, K., Poels, K., Vandebosch, H.,Deboutte, G…. De Bourdeaudhuij, I. (2018). The efficacy of the Friendly ATTAC serious digital game to promote prosocial bystander behavior in cyberbullying among young adolescents: A cluster-randomized controlled trial. Computers in Human Behavior, 78(C), 336-347. Ericson, N. (2001). Addressing the problem of juvenile bullying. OJJDP Fact Sheet. Washington, DC: U.S. Department of Justice. Espinoza, G., & Wright, M. (2018). Cyberbullying experiences among marginalized youth: What do we know and where do we go next? Journal of Child & Adolescent Trauma, 11(1), 1-5. Farrington, D., & Baldry, A. (2010). Individual risk factors for school bullying. Journal of Aggression, Conflict and Peace Research, 2(1), 4-16. Hymel, S., & Swearer, S. M. (2015). Four decades of research on school bullying: An introduction. American Psychologist, 70, 293-299. Kaltiala-Heino, R., Rimpelä, M., Marttunen, M., Rimpelä, A., & Rantanen, P. (1999). Bullying, depression, and suicidal ideation in Finnish adolescents: School survey. BMJ, 319, 348-351. Kiriakidis, S. P., & Kavoura, A. (2010). Cyberbullying: A review of the literature on harassment through the internet and other electronic means. Family & Community Health, 33(2), 82-93. Klomek, A. B., Sourander, A., & Elonheimo, H. (2015). Bullying by peers in childhood and effects on psychopathology, suicidality, and criminality in adulthood. The Lancet, 2, 930-941. Kowalski, R. M., Giumetti, G. W., Schroeder, A. M., & Lattanner, M. R. (2014). Bullying in the digital age: A critical review and meta-analysis of cyberbullying research among youth. Psychological Bulletin, 140(4), 1073-1137. Kowalski, R. M., Limber, S. E., & Agatston, P. W. (2012). Cyberbullying: Bullying in the digital age (2nd ed.). Malden, MA: Wiley-Blackwell. Lee, S., Kim, C.-J., & Kim, D. H. (2014). A meta-analysis of the effect of school-based anti-bullying programs. Journal of Child Health Care, 19(2), 136-153. Limber, S. P. (2003). Efforts to address bullying in U.S. schools. American Journal of Health Education 34(5), S23-S29. Llorent, V. J., Ortega-Ruiz, R., & Zych, I. (2016). Bullying and cyberbullying in minorities: Are they more vulnerable than the majority group? Frontiers in Psychology, 7(1507), 1-9. Menesini, E., & Salmivalli, C. (2017). Bullying in schools: The state of knowledge and effective interventions. Psychology, Health & Medicine, 22 (1, supplement), 240-253. Mishna, F., Khoury-Kassabri, M., Gadalla, T., & Daciuk, J. (2012). Risk factors for involvement in cyberbullying: Victims, bullies and bully-victims. Children and Youth Services Review, 34(1), 63-70. Molcho, M., Craig, W., Due, P., Pickett, W., Harel-Fisch, Y., Overpeck, M., & HBSC Bullying Writing Group (2009). Cross-national time trends in bullying behaviour 1994-2006: Findings from Europe and North America. International Journal of Public Health, 54, 225-234. Molnar-Main, S. (2014). Best practice in bullying prevention: Components of effective practice at the school level. Camp Hill, PA: Center for Safe Schools. Nedimović, T., & Biro, M. (2011). Risk factors for bullying. Applied Psychology, 4(3), 229-244. Nocentini, A., Zambuto, V., & Menesini, E. (2015). Anti-bullying programs and Information and Communication Technologies (ICTs): a systematic review. Aggression and Violent Behavior, 23, 52-60. Rivers, I., & Smith, P. K. (1994). Types of bullying behaviour and their correlates. Aggressive Behavior, 20, 359-368. Seeley, K., Tombari, M. L., Bennett, L. J., & Dunkle, J. B. (2011). Bullying in schools: An overview. Juvenile Justice Bulletin. Washington, DC: U.S. Department of Justice. Shields, A., & Cicchetti, D. (2001). Parental maltreatment and emotion dysregulation as risk factors for bullying and victimization in middle childhood. Journal of Clinical Child Psychology, 30(3), 349-363. Smith, P. K., Mahdavi, J., Carvalho, M., Fisher, S., Russell, S., & Tippett, N. (2008). Cyberbullying: Its nature and impact in secondary school pupils. Journal of Child Psychology and Psychiatry, and Allied Disciplines, 49(4), 376-385. Sourander, A., Klomek, A. B., Ikonen, M., Lindroos, J., Luntamo, T., Koskelainen, M., ... & Helenius, H. (2010). Psychosocial risk factors associated with cyberbullying among adolescents: A population-based study. Archives of General Psychiatry, 67(7), 720-728. Steeves, V. (2014). Young Canadians in a wired world, phase III – Cyberbullying: Dealing with online meanness, cruelty and threats. Ottawa, ON: MediaSmarts. Taiariol, J. (2010). Cyberbullying: The role of family and school (Doctoral dissertation). Available from Dissertation Abstracts International. Thomas, H. J., Connor, J. P., & Scott, J. G. (2014). Integrating traditional bullying and cyberbullying: Challenges of definition and measurement in adolescents – a review. Educational Psychology Review, 27(1), 135-152. Tokunaga, R. S. (2010). Following you home from school: A critical review and synthesis of research on cyberbullying victimization. Computers in Human Behavior, 26, 277-287. Ttofi, M. M., Farrington, D. P., Lösel, F., & Loeber, R. (2011). The predictive efficiency of school bullying versus later offending: A systematic/meta-analytic review of longitudinal studies. Criminal Behaviour and Mental Health, 21, 80-89. Vaillancourt, T., Faris, R., & Mishna, F. (2017). Cyberbullying in children and youth: Implications for health and clinical practice. The Canadian Journal of Psychiatry, 62, 368-373. Vaillancourt, T., Trinh, V., McDougall, P., Duku, E., Cunningham, L., Cunningham, C., Hymel, S., & Short, K. (2010). Optimizing population screening of bullying in school-aged children. Journal of School Violence, 9, 233-250. Van der Wal, M. F., de Wit, C. A. M., & Hirasing, R. A. (2003). Psychosocial health among young victims and offenders of direct and indirect bullying. Pediatrics, 111, 1312-1317. Williams, K. R., & Guerra, N. G. (2007). Prevalence and predictors of internet bullying. Journal of Adolescent Health, 41(6, supplement), S14-S21. A number of research studies that examine risk factors for bullying and cyberbullying were reviewed, including: Ang & Goh (2010); Baldry & Farrington (2005); Bowes et al. (2009); Farrington & Baldry (2010); Kowalski, Limber, & Agatson (2012); Mishna et al. (2012); Nedimović & Biro (2011); Olweus & Limber (2010); Shields & Cicchetti (2010); Sourander et al. (2010); Taiariol (2010); and Ybarra & Mitchell (2004). A few research studies that examine protective factors for bullying and cyberbullying were reviewed, including: Baldry & Farrington (2005) and Williams & Guerra (2007). To receive copies of these resources, please contact the Research Division, Public Safety Canada at PS.CSCCBResearch-RechercheSSCRC.SP@canada.ca.